As you enter through a private courtyard you will immediately fall in love with this 4 bedroom, 3 bathroom, 3119 sq. Ft. Single level home on nearly an acre. 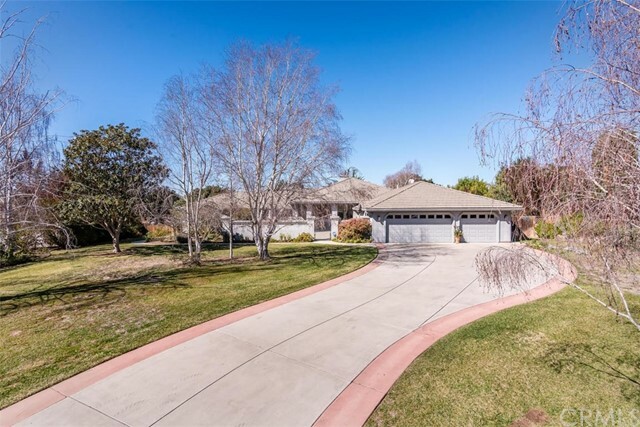 This very private culdesac home is situated in a neighborhood with no hoa fees. This well designed open floor plan is perfect for a large family and entertaining. This beautiful kitchen is a cooks dream and has an island with a vegetable sink, ample size breakfast bar, pantry, oak cabinets throughout, high end appliances and fixtures and plenty of storage space. The kitchen area opens up to a large great room where you can cozy up to the fireplace, enjoy the view of the backyard and have access to the patio area. The large master suite has private access to the backyard, a wonderful master bathroom with skylight, walk in shower, jacuzzi tub, beautiful tile throughout and a walk-in closet with built-ins. The fourth bedroom with built-ins or office is on the opposite side of the home from the other bedrooms and has a private entrance with access to a hall bathroom. A well landscaped front and backyard has 7 drip lines on an automatic timer and offers plenty of opportunity for outdoor entertaining. This home offers a low maintenance stucco exterior with tile roof, large indoor laundry room, top of the line anderson door and windows, intercom, recirculating pump for instant hot water and a 3 car attached garage. Pictures are from february 2018 prior to previous sale in april 2018. Information not verified. For more information or make an appointment to see property ID SP19020321.